Discussion in 'Sega Dreamcast Development and Research' started by _shameless_, Sep 30, 2018. If you need to burn DC discs one session at a time, CDRWIN is the way to go. 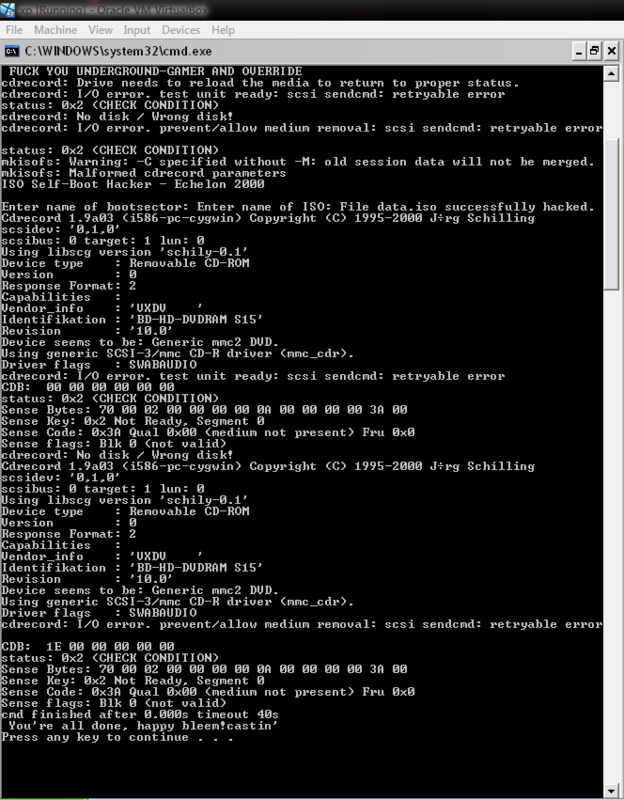 Unlike cdrecord, it doesn't add an annoying pregap to mess up the LBA of the second session. Even though cdrecord has an option to disable the pregap, it's never worked for me: the LBA is always off by 2.
Who cares really about that 4kB? Plus, some drives back then had problems with 150 sectors tracks, so 152 was a good idea for compatibility. I'll take the flexibility of command line over saving 2 sectors any day. Just to be certain, you have to replace the 'x'-es by the actual address of the virtual drive. e.g. "1,0,0" or something. I think scanbus is the command to list the drives and their addresses. Of course. No dice with Daemon Tools, on macOS at least. I had some luck tonight with Phantom Drive, the batch files worked perfectly. -msinfo returned the expected track information. No errors. I'll try burning the resulting image tomorrow, using Virtual CD. Who cares really about that 4kB? I'm not talking about the space saved. I'm talking about LBA protections that require the second session to start at a particular LBA, and cdrecord messing up the dummy file padding. Sure, I could reduce the dummy size by 4KiB to compensate for cdrecord's stupidity, but I want perfect session sizes! I only managed/attempted to cdrecord to the phantom drive, not either of the drives provided by virtual cd. I can't figure out how to use Virtual CD at all, it's way too complicated. But apparently it will let me burn a phantom drive to a physical disc. If you need to burn DC discs one session at a time, CDRWIN is the way to go. Do you have a guide or tips on using CDRWIN for multi session discs? It's been decades. It's exactly as hard to compute for the dummy with or without the 2 extra sectors. And if you're doing data/data, you can skip the burning using my pack and everyone is happy forever. Thanks for that. We'll plough on regardless if it's OK with you. Multi-session discs, such as CD Extra discs, are not supported. Phantom Drive always closes the disc at the end of the first recording session. There could be a way to build multisession CDI from the ground up, but I lack in knowledge of the particular format and in time to study it. So for now, the best approach is still to burn a CD-RW and then image it. I've always used the Echelon tutorial to pick the settings. f) Click the start button and you are burning. For the first session, make sure "Open New Session" is checked, then uncheck it for the second session. This will allow you to make a merged data/data disc where the second session can access files stored in the first session, assuming you made the second ISO with the -M option in mkisofs. CDRWIN is no-go for me, because I only have a USB writer and it doesn't recognise it. The only games that can be done are ones confirmed working. I don't even remember if that one was compatible or not? You can check a few lists out here. Oh I see looks like they have this to say about Doom. graphics all in pieces and see through. plays ok tho. This is why a lot of us want it though, and for good reason. So I've just played Rakugaki Showtime on my Dreamcast, and it was glorious. 7. PSX game loads... enjoy! In other news I feel I am getting close with being able to burn new self-contained Bleemed discs through modern GUI apps only. Those "bleemed" disc are nothing more that the bleem beta put on a second session after a PSX ISO was burned on the first. This way when bleem is loaded, it reads the first session of its own disc and boots it. I'm trying hard to find something positive, new or useful in your post above. See the edit at the end. It's relatively easy to do and it's not new? Damn I had read "In other words, ..." Instead of "In other news, ...", hence my confusion. Sorry if I did sound like a jackass, I thought you meant that you playing that game implied progress on the GUI front. Thanks for staying polite with my unintended jackass self. Mea Culpa. emsef, TerdFerguson, fafadou and 1 other person like this. I haven't attempted to comprehend all of the discussion in this thread, so I haven't figured out why someone is trying to do this, but I sort of did a crappy version of this back in 2004. I burned multiple discs with the old common 0,11700 LBA, ripped them as CDI, and figured out where the 2nd session track data started and ended. I then made two separate files (header.bin and footer.bin) such that I could assemble a valid self boot CDI image by building my data track for that LBA and converting it to 2336 byte sectors with ECC/EDC intact, then it was just a matter of combining header + data + footer and updating the footer to properly set the size of the data session. I built a bunch of not-burnable 100+ minute CDI's for games with nothing removed/downsampled this way. I can't really provide any of the assets to do this anymore, but if someone wants to do something similar and chop up a CDI: Once you find the 'header' and 'footer' portions, (e.g. everything before and after the data track that you build with mkisofs then convert to 2336 sector size) the size of the 2nd session is 5094 bytes into the footer. It's the number of sectors in your data track file, plus 2. So ((data.size / 2336)+2). If you're chopping up a valid CDI image, nothing else needs to change for it to work in a virtual drive.